These are options that apply only to pie charts. Look at Angle: The angle, in degrees relative to horizon, from which you appear to be looking at the 3D chart. A value of 0 means you are looking at the chart from the side, while a value of 90 means you are looking at the chart from the top, giving it a flat, 2D appearance. Start Angle: The angle, in degrees, where the first slice begins. This is relative to the positive X axis on the screen, so a value of 0 will coincide with that direction. Thickness, %: The thickness of the 3D pie chart. Higher values result in thicker charts, lower values in thinner ones. 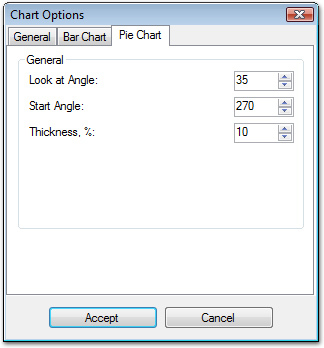 Note that the actual pixel thickness also depends on the look-at angle of the chart.